For months, consumers have been itching to know whether it will be Samsung or Apple that has the first in-screen fingerprint scanner in their next smartphone. Now, reputable researcher Jiutang Pan has taken to Weibo to report that the answer is neither. According to Pan, China's Vivo will be the first to launch with the fingerprint reader embedded into the screen within the next few months. It seemed likely that Samsung would be winning this race with the Galaxy Note 8. However, we reported that Samsung made an official statement to Naver that they decided to discontinue their work on the feature in the Galaxy Note 8 due to technical limitations at this time. This left fans disappointed and meekly hoping for some chance that the iPhone 8 wouldn't let them down on this. But with no word from Apple, people should turn their hopes to Vivo now. According to Pan, the new phone from Vivo will be released before the iPhone 8, meaning that if the reports are true they would officially beat Apple to this long awaited feature. He also believes, however, that the iPhone 8 will also have the feature. With his report, Pan also attached a four-second video presumably of himself testing Vivo's new phone. 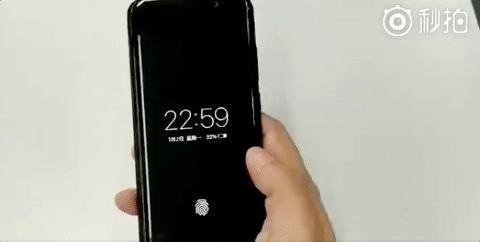 In the video, we can clearly see that he opens the phone with his finger, pressing it onto a fingerprint icon on the screen. When the phone is unlocked, the icon disappears as well. This isn't Vivo's first attempt at smartphones either. The company is smaller than Apple or Samsung but it according to the IDC it is currently the fifth largest manufacturer in global smartphone shipments. Vivo has also had innovations in terms of smartphone size and the dual selfie camera that they released. While it is unknown what the name of this new Vivo smartphone is, Gizchina pointed out that the phone looks similar to the Vivo X9 Plus, which has already been released. If this information is true, it's possible that Vivo will announce it at the upcoming Mobile World Congress this month. If it isn't, then we'll just have to keep crossing our fingers that we'll see the in-screen fingerprint sensor in September with the iPhone 8 (if it doesn't get pushed back again).